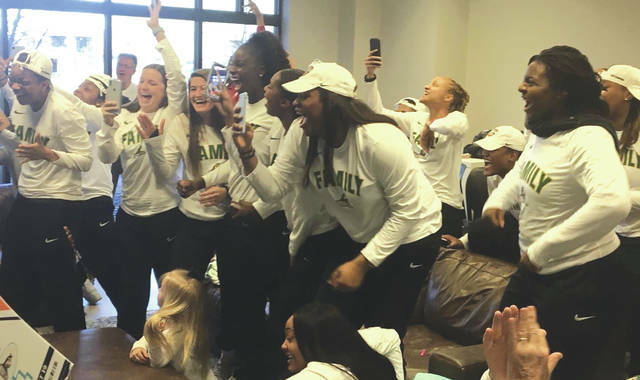 FAIRBORN — The Wright State University women’s basketball team learned that their first-round NCAA tournament matchup will take place in College Station, Texas, a bit further than their previous NCAA tournament appearance. In 2014, the Raiders played in their inaugural NCAA Big Dance just down Interstate 75 in Lexington, Kentucky. This time, the Raiders (27-6) will head 1,098 miles southwestward to take on Texas A&M University, of the Southeastern Conference. The Aggies (24-7) were the No. 3 seed in the SEC women’s tournament, losing to Arkansas in the SEC tournament semifinals. A&M is the NCAA’s No. 4 seed in the Chicago Regional and will host the Horizon League champion No. 13-seeded Raiders, Big East tournament runner up No. 5 seed Marquette (26-7), and Conference USA regular season and tournament champ No. 12 seed Rice (28-3) for the tourney’s first two rounds. The WSU-A&M winner will take on the Marquette-Rice winner in the tournament’s second round. In this season’s final Associated Press regular season coaches poll, Texas A&M was ranked 14th nationally, Marquette was ranked 18th, Rice 21st, and Wright State was one of 11 schools to receive a vote outside of the top 25. Whomever advances out of the Texas A&M bracket, they’ll likely face third-ranked Notre Dame (30-3) in the regional semifinals on March 30. The Fighting Irish are hosting a four-team bracket in South Bend, Indiana with 16-seed Bethune-Cookman, no. 8 Central Michigan and no. 9 Michigan State this weekend. According to KBTX in College Station, Texas A&M is one of seven NCAA schools to have qualified for at least 14 consecutive tournaments. Perennial powerhouses Baylor, UConn, DePaul, Notre Dame, Stanford and Tennessee are the others. Baylor, UConn, Stanford and A&M are the only schools from that bunch to be seeded sixth or higher during those 14 seasons. Wright State’s opening round game against the Aggies is scheduled for a 4 p.m. Friday, March 22 start, and will be televised on ESPN2. Fans can purchase tickets on Texas A&M University’s 12thManFoundation website at https://bit.ly/2CquTYl . The Wright State men’s basketball team will make it’s first-ever appearance in the National Invitational Tournament (NIT), on Tuesday, March 19 when they will go to Littlejohn Coliseum in Clemson, S.C. to take on the Clemson Tigers (19-13). Wright State (21-13) earned its spot in the NIT tournament as the Horizon League’s regular season champion. WSU is the tournament’s No. 7 seed; Clemson is a No. 2 seed. Game time is set for 7 p.m., and fans can listen to the game online on the iHeart Radio app at Big 106.5 with commentators Chris Collins and Jim Brown. The Clemson-WSU winner will take on the Furman-Wichita State winner in the second round. The first three rounds of the NIT are held at host sites. The NIT Final Four games will take place April 2 and 4 at New York City’s Madison Square Garden.